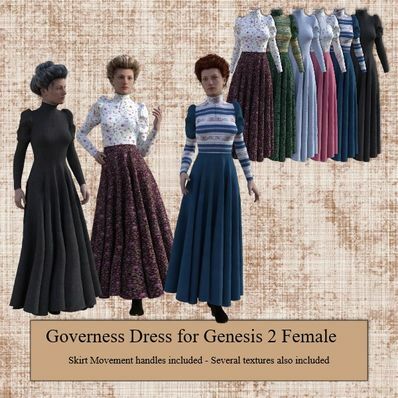 Governess Dress for Genesis 2 Female for use in Daz Studio 4.8+. This dress is awesome - looks great paired up with the MFD fictionalbookshelfs vintage dress and other similar cut dresses for a more varied but still uniform scene. Lovely Dress, great done! Thank you so much! This is lovely, thank you so much!! just downloaded it thank you again! These long dresses will certainly come in handy in some "period" work. Thank you so much!! Wow! Love long skirts! Thanks so much! The old styles are just so interesting and fun to work with! You are the BEST!! File has been updated, should be working now. Sorry about that. Sorry about the textures. I’ll get it sorted and update the file. Thanks marchioness. Hi wendy, thanks for the beautiful (and realistic!) dress! Thank for continuing to support GF2 too! There is a problem with textures path: all materials search textures in a wrong path (C:\User\Wendy\Desktop\Governess Dress\...). Moreover, materials 2 to 6 search a jpg file with the filename ending in "a" while the files in textures folder are .png and don't end in "a"
Great design and very nice textures. Many uses for such an outfit in my production wardrobe... Thank you so much! How did you know this was exactly what I needed? As always, THANK YOU for continuing to support G2F!! Thank you for continuing support of G2F. Great work as always! Thank you! It looks just wonderful; thank you very much! Sorry about that. sorted now. looks wonderful...but the link doesn´t work! thank you very much !